SAN DIEGO – Douglas Wilson Companies (DWC) has celebrated the opening of Sienna at Otay Ranch, a $32 million project that is the company’s first in a new series of senior living communities planned for the Western Region over the next 10 years. 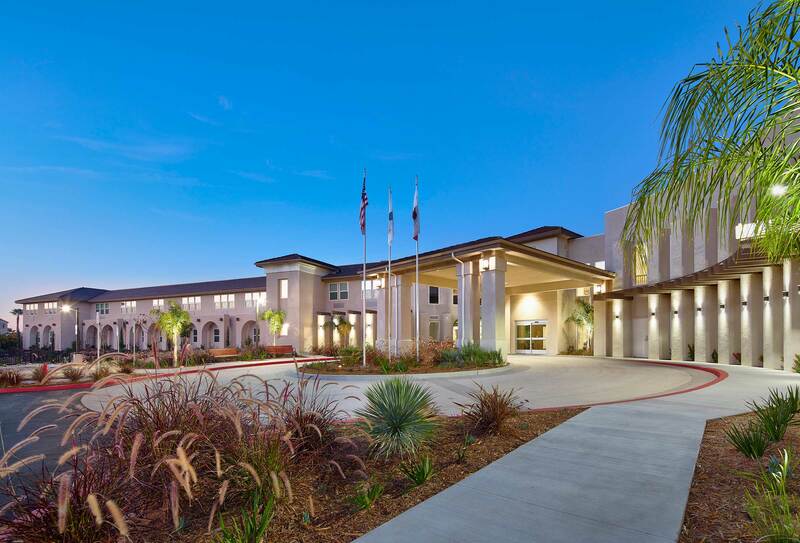 Located at 1290 Santa Rosa Drive in Chula Vista’s popular Otay Ranch, Sienna at Otay Ranch is a 111-unit, two-story senior living building comprised of 85 apartments for assisted living and 26 units for memory care. Sienna at Otay Ranch offers studio, one-and two-bedroom floor plans from 500 to 800 square feet, with monthly rents ranging from $3800 to $5500, including meals and housekeeping. Personal services and onsite care are priced separately. Upmarket resident amenities include a 7 a.m. to 7 p.m. full-service restaurant, an outdoor courtyard planted with herb gardens, a theater, card rooms, library, computer rooms, a bistro and a multi-purpose area that can be used for classes and other special activities. Services available through the onsite Wellness Center include geriatric care, optometry, dentistry, podiatry, rheumatology, lab services, and a regularly scheduled Nurse Practitioner. Now entering its 30th year in the real estate business, DWC prides itself on a quick response to market changes. After completing San Diego’s iconic mixed-use Symphony Towers in 1989, Wilson emerged as a leading developer of high-end condos in support of downtown San Diego’s new Petco Park baseball stadium. When real estate faltered, he pivoted to become one of the nation’s leading Receivers, handling more than $15 billion in troubled properties across all asset classes. DWC is joined in the Sienna at Otay Ranch senior living joint venture by Milestone Retirement Communities, who handles all management responsibilities. Headquartered in San Diego with offices in Washington, D.C., San Francisco, Phoenix and Las Vegas, Douglas Wilson Companies’ current scope of services includes land entitlement and brokerage, senior housing development, and a thriving practice in real estate and wealth-transfer advisory services for legacy families and large private, public and non-profit institutions. Because DWC has provided receivership services in over 1,200 matters in 35 states, the firm has developed over 200 institutional relationships with banks, pension funds, trust and life insurancecompanies, and private equity firms to provide a portfolio of consulting, advisory and fiduciary services. For more information, visit: www.douglaswilson.com.